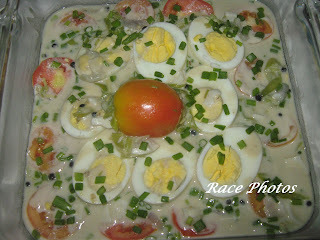 This is again one of the entries in URS Food Competition last month. These are the ordinary eggs we always have in our kitchen and pantry that we didn't bother to cook with sauce or anything like this one. It's an original simple recipe where eggs were boiled first and cooked in coconut milk with garlic, onion, tomatoes , pepper and some green spices. You could add up some other ingredients if you want. We've never cooked eggs like this before and I'm going to try this for sure. Looks yummy! Want some? For those who have problems with high cholesterol please limit your intake. Wow! Bago nga ito sa pandinig ko, fried egg and boiled lang ang alam ko gawin sa itlog, lol! i wonder how many hard boiled eggs were used?